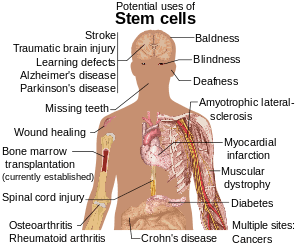 In the latest in a series of experiments testing the use of stem cells to treat neurological disease, researchers at Henry Ford Hospital have shown for the first time that microscopic material in the cells offers a “robust” treatment for crippling stroke. “In this study we pioneered a totally new treatment for stroke, and possibly for all neurological disease,” says Michael Chopp, Ph.D., scientific director of the Henry Ford Neuroscience Institute. The new study is published online in the current issue of Journal of Cerebral Blood Flow and Metabolism. It focused on exosomes, blister-like microscopic “bubbles” that once were thought to carry and get rid of “old” proteins that were no longer needed by the body. After they were recently found to also carry RNA, whole new fields of study were suggested – including the pioneering work at Henry Ford. The research team found that after inducing stroke in lab rats, injecting exosomes containing this genetic material into their blood prompted remodeling of the affected brain, including increased production of new brain cells, blood vessels and neural rewiring. Together, these effects significantly improved neurological function that had been impaired by stroke. Using bone marrow from the adult rats, the researchers extracted stem cells – specifically mesenchymal cells, or MSCs – that were then employed to generate exosomes. The researchers induced stroke by occluding an artery in the brain of each rat to block blood flow for two hours. Twenty-four hours later, they injected the exosomes into a vein in each rat’s tail. The rats’ physical agility and neurological responses were tested before stroke and after treatment with the exosomes, and the results were compared. April 19, 2019 - Life-saving stroke treatment unit serves patients in Colorado Springs KRDOThere are only 20 across the U.S., and one of them is operating out of UCHealth Memorial Main hospital in Colorado Springs. April 19, 2019 - Experimental antiplatelet compound for acute stroke shows promise Science DailyAn experimental compound inhibited clot formation without increased bleeding, a common side effect of current anticlotting therapies, in a phase I study. April 15, 2019 - Treating a stroke with a Thrombectomy KHOU.comDr. Yazan Alderazi, vascular neurologist with Memorial Hermann the Woodlands Medical Center, demonstrates how to treat a stroke with a Thrombectomy. SVIN Announces the Advanced Stroke Emergency Support EMS Course NOW AVAILABLE!